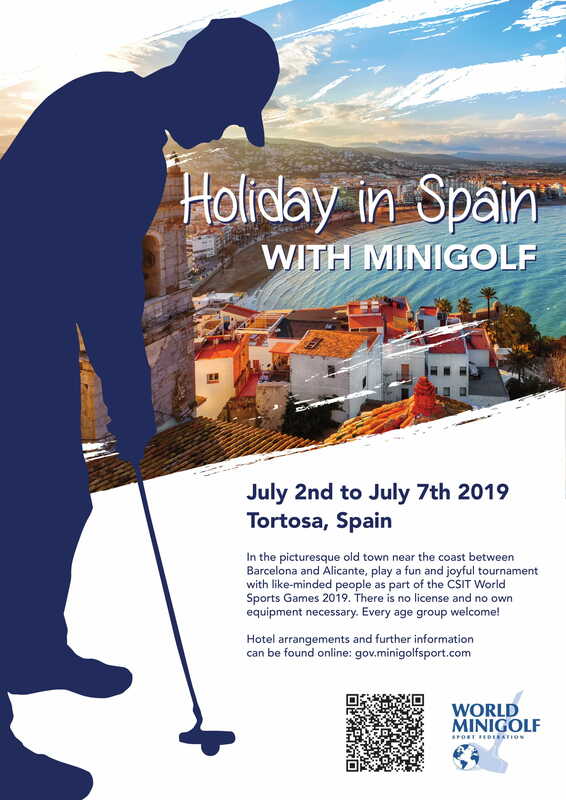 The WMF International Minigolf Speed Championships 2019 will be organized as a part of the CSIT World Sport Games 2019 (http://2019.csit-world-sports-games.com/). Because the event is designed on historical base for workers and amateurs it is expected that WMF participates with the players on all levels. The event is open for everybody. Therefore, it is perfect to combine the minigolf event with some nice holidays in a fantastic holiday area with wonderful beaches and with distance of only 90 minutes to Barcelona. On three competitions days, the participants are running for medals each day in 6 age categories (3 female + 3 male categories) in three different speed disciplines. Preliminary rounds will be organized with start in the morning until early afternoon and with finals in late afternoon each day. The minigolf lanes will be located in the heart of the city at the fan festival area under palm trees, which guarantees a spectacular event for the participants and the media! WMF will arrange a booking for you for the full period of the event (5 nights full board + registration fee + local transport included) in category B, which is relevant for us as partner organization. WMF will register you without accommodation for a participation fee of 120 Euro (category C), which is the fixed fee of the organizer, and you take care of the accommodation yourself. As many shots as possible during 1 minute on one lane, short break to move to the next lane, only hole-in-ones count (mixed-pair competition also possible depending on registrations). One round with 12 lanes one shot each lane, hole-in-one counts, max time 120 seconds for the total round, one penalty point for each 10 second overtime. Chase: 1 player starts at lane 1 the opponent starts at lane 7, a player can move to the next lane only after a hole-in-one, target is to catch with the opponent, winner of the match is who holes in before his opponent holes in the lane in front of him. The exact format of each day will be decided as soon as WMF has a better overview about the number of participants at the end of the registration period. The event is also played with one official championship ball to have it more simple also for external participants and to keep the conditions equal for everybody. Coaching during competition is not allowed. You can find attached the drafted course layout. The 12 lanes are especially developed with miniaturegolf style but a little bit smaller as regular to allow easier hole in ones with respect to the speed as main factor of the event. You will be contacted by email within 48 hours with a registration form and an information about the total amount to be paid including the bank account information details. Please let WMF know urgently that you are interested to take part at this new and spectacular event.